Are you confused by all the techie language surrounding websites and online tools? Maybe you’re baffled by bounce rates, dumfounded by DNS, horrified of .htaccess, or perplexed by PHP? If so, I’ve put together this article just for you! It’s a nerd-to-English dictionary of common techie terms that online entrepreneurs have to deal with. You’ll find a clear explanation of each term, and they’re all interlinked, so you can hop around the dictionary easily. I’ve also linked off to relevant websites where appropriate. Once you’ve explored this dictionary, you’ll be chatting confidently with your web designer/developer and other techie types about your website and digital tools! You might also like to bookmark this page so you can refer to it in future. Also known as split testing. 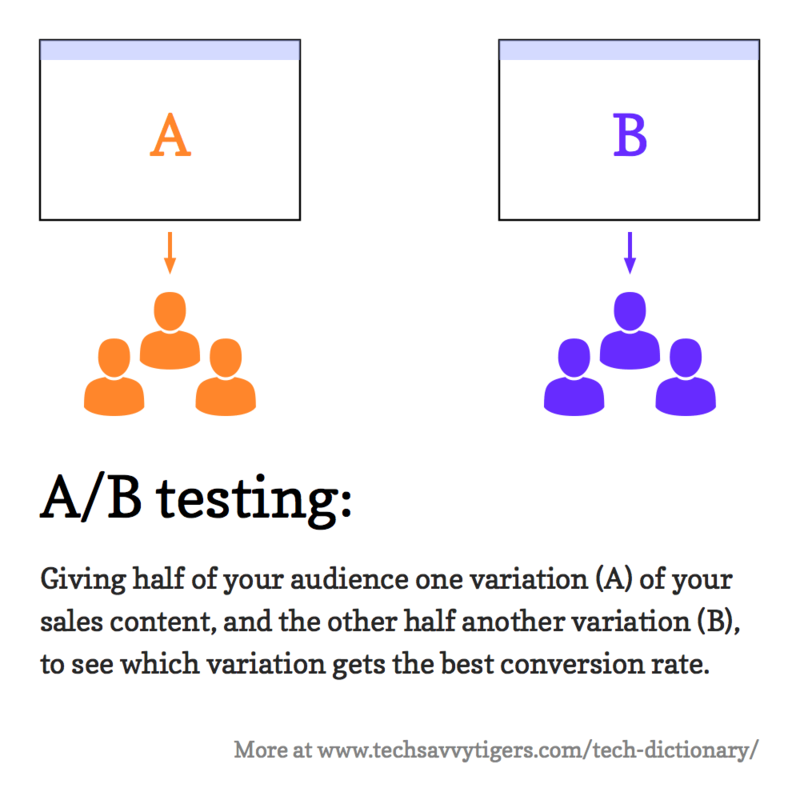 A technique where you randomly give half of your audience one variation (A) of your sales content, and the other half another variation (B), and see which variation gets the best conversion rate. This allows you to see which version of your content is the most effective for bringing in customers. A/B testing is often used for testing two different versions of a webpage, or two different variations of an email campaign. A highly effective WordPress anti-spam plugin developed by Automattic (the makers of WordPress). Akismet scans your blog comments as they are posted and compares them against its huge spam database. If it thinks a comment is spam, it moves it to the Spam tab in your WordPress admin. Akismet is free for personal blogs, and a few dollars a month for commercial sites. The world’s most popular web server software. Apache runs on your web server and sends your web pages, images, videos and other content to your visitors’ web browsers. It’s open-source and currently serves about 46% of all websites on the Internet. Other popular web server software includes Microsoft’s IIS and the open-source nginx. A piece of software that automatically replies to the sender (for example, to send an “out-of-office” auto-reply). In the field of email marketing, it specifically refers to a feature of many email marketing services (such as MailChimp, AWeber and ConvertKit) that automatically sends a series of emails to the subscribers of an email list. A longstanding and popular email marketing service. It has a large number of professional email templates, and boasts a 99% deliverability rate (which means that 99% of emails reach your subscribers’ inboxes). AWeber also offers phone and text chat support. An image made up of pixels. Bitmap images get more blocky as you zoom into them. Also see vector image. An online marketing term that measures how good a website is at keeping visitors. 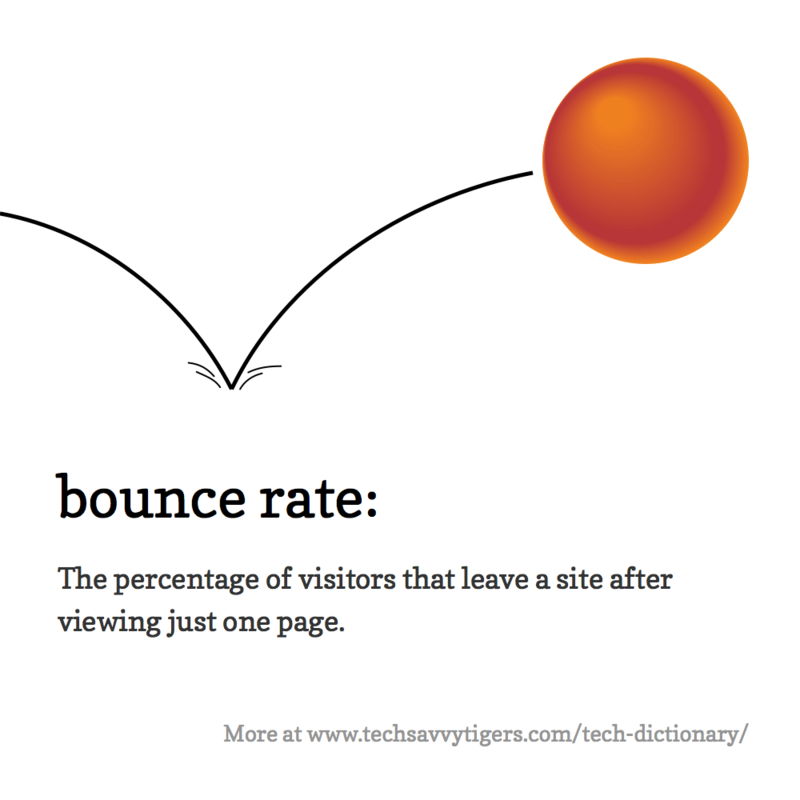 It represents the percentage of visitors that leave the site after viewing just one page (or “bounce”). Typical bounce rates vary between 65-85%, although it very much depends on the type of content that the visitor is looking at. An online tool that lets you queue up posts for social networks such as Facebook, Twitter and LinkedIn, then submit those posts over several days or weeks. This allows you to do your social media posting in batches, saving you time. The free Individual Plan lets you connect one social profile per social media platform (such as Facebook), and schedule up to ten posts. The paid Awesome Plan lets you connect up to ten social profiles and schedule up to 100 posts; it also supports Pinterest sharing. A web-based graphic design tool that lets you create images and designs for websites, social media and print. Canva is easy to use; you can use templates, fonts and images from its large library, as well as upload your own images. Designing a graphic is as simple as dragging elements around on the page. The basic version is free, but many of the designs and images are paid. There’s also a free iPhone/iPad app. A worldwide network of servers that can deliver your website’s content to your visitors. The main advantage of using a content delivery network is that your visitors can view your site using a server near them, which results in faster, more reliable web browsing. It also takes the load off your own server, and can also help to reduce the damage caused by DDoS attacks. Popular content delivery networks include CloudFlare (free), Amazon CloudFront and MaxCDN. An online marketing term that measures how many website visitors go on to “convert”, or complete a goal, such as buying a product or signing up to an email list. Conversion rates can vary widely, from 1-5% for many online stores, all the way up to 50% or more for highly focused landing pages. A relatively new email marketing service that is gaining in popularity. It’s specifically tailored to online entrepreneurs and bloggers. It makes it really easy to do things like multiple opt-ins and drip-feed email courses. A popular web hosting control panel that lets a website owner manage their web server from within their browser. You can use cPanel to configure your server settings; create websites, databases and email accounts; upload and download files; set file permissions; and lots more. Plesk is another well-known hosting control panel. Cascading Style Sheets. A language for styling the elements inside a webpage. You can use CSS to set things like the position, font, text size, colours, background images, margins, padding and borders of the elements inside your pages. A collection of data that is organised to make it easy to access and use. On a web server, databases are usually managed using database software such as MySQL. A database contains one or more tables. Each table holds data about a specific type of thing. For example, WordPress stores all of its pages and blog posts in a table called wp_posts, and all of its blog comments in a table called wp_comments. 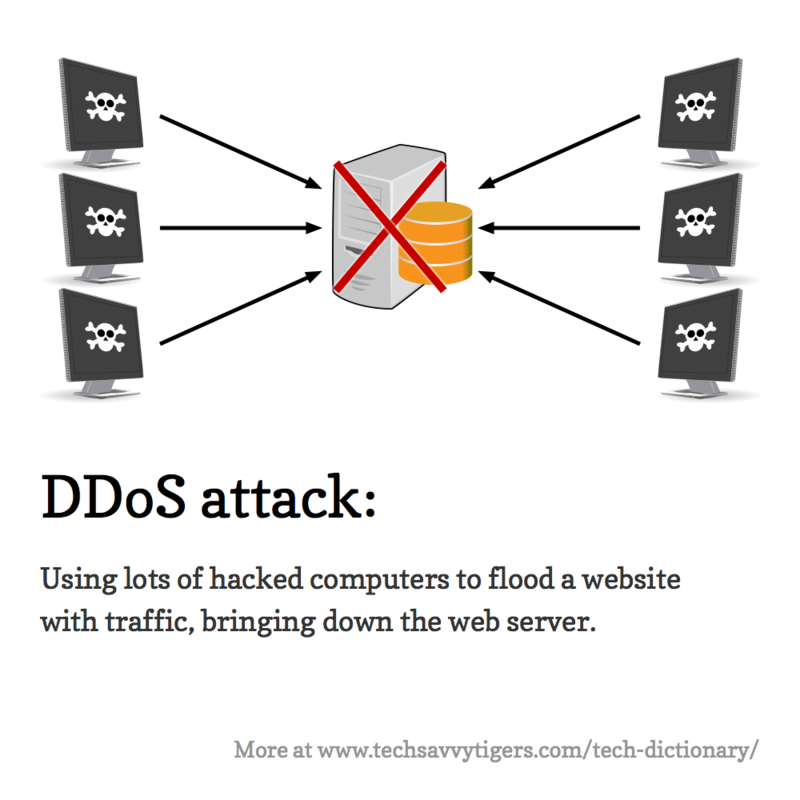 Distributed denial-of-service attack. A type of attack on a website where the attacker uses lots of hacked computers to flood the website with traffic, bringing down the web server. You can protect your site against DDoS attacks by using a content delivery network, or a website protection service such as Sucuri. A popular WordPress theme created by Elegant Themes. It features the Divi Builder (also available as a separate plugin), which makes it easy to create custom webpage layouts visually within WordPress, without requiring any coding skills. Domain Name System. The system that organises all of the Internet’s domain names. A service offered by many domain registrars that lets you take all the traffic going to one domain and forward it on to another domain. For example, if you registered example.com with your registrar, you would usually be given the option to forward it to another domain (such as elated.com). Once you’ve set up the forwarding, requests to any URLs on www.example.com are forwarded to the equivalent URLs on www.elated.com. Usually, domain forwarding is done using 301 redirects, although it’s also possible to do it at the DNS level. A string of text (containing letters, numbers, hyphens and/or dots) that identifies a computer or website on the Internet — such as www.example.com. When you type a website address into your web browser, you computer looks up the site’s domain name using your ISP’s name server. The name server sends back the IP address of the web server that hosts the website. Your browser can then use the IP address to send a request to the web server in order to retrieve the webpage you asked for. As well as web servers, domain names can also point to mail servers so that you can send and receive email at your domain. You can register a domain name for your business using a domain registrar. A company that you can use to register a new domain name, renew your domain name, and point your domain name to your web server. Popular domain registrars include Namecheap and GoDaddy. Country-code top-level domains, such as .uk and .au, tend to have their own registrars in their respective countries. An automated social media posting tool. You create a library of posts grouped by topic, then set up a schedule for posting about different topics at different times. Edgar then automatically posts your content to your social networks. It also recycles older updates, which means that — unlike Buffer — you don’t have to keep filling up your queue. Edgar is a paid service and is currently invite-only. Special tags added to files and folders that determine who can do what with the files. Sometimes you’ll need to set permissions on files after you upload them to your server, so that the server software is able to do things like alter files and create folders. You can set permissions using your FTP client, or using a hosting control panel such as cPanel or Plesk. 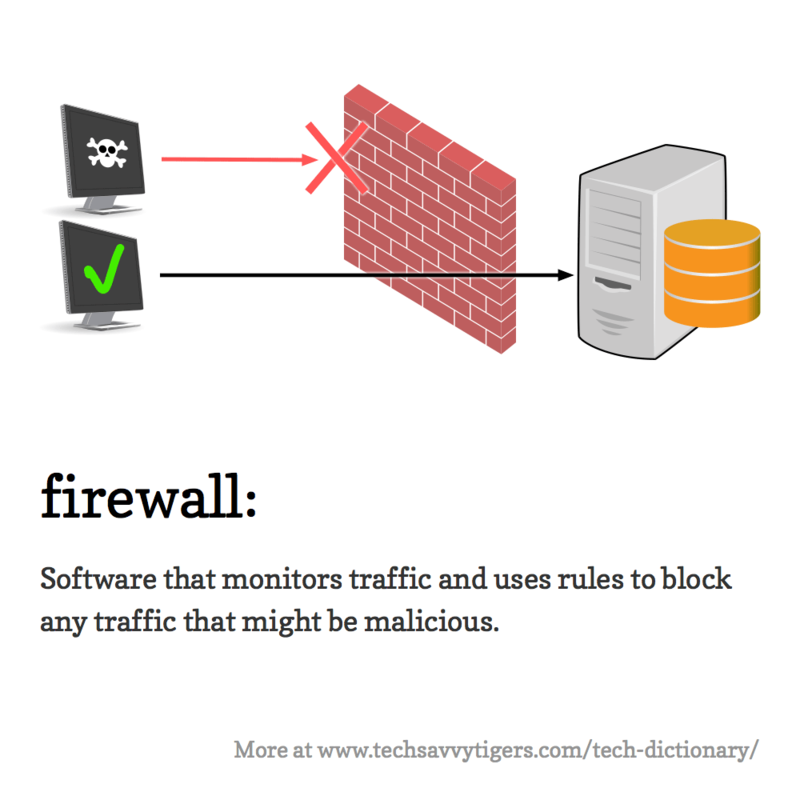 Software that monitors all traffic going in and out of a system (such as a computer network or a web server) and uses rules to block any traffic that might be malicious (such as malware or hacking attempts). File Transfer Protocol. This lets you upload files from your computer to your web server (and download them from the server to your computer). To do this, you need an FTP client: an app that you install on your computer that communicates with your server via FTP. Popular FTP clients include FileZilla, Cyberduck and CuteFTP. A popular WordPress theme from StudioPress that is really a framework for creating other themes. You start with the Genesis theme, then create a child theme with your own design. There are also hundreds of pre-built Genesis child themes available from StudioPress and third parties. Genesis is popular among WordPress developers because it saves them a lot of coding time when building a theme. Graphics Interchange Format. A relatively old format for compressing and storing bitmap images, but still widely used on the web. GIF is lossless, which means it doesn’t lose any information from an image when it compresses it. Works best for images with flat areas of single colour, such as diagrams and charts. For photos, JPEG is usually a better bet. PNG is generally better than GIF when it comes to creating non-photographic web images. However, GIF can do one thing that PNG can’t (yet) do: create animated images that display on all popular browsers. An easy-to-use e-commerce service designed to allow creators to sell products directly to their customers. Although it’s primarily designed for selling digital downloads — such as eBooks, music and comics — it also supports selling physical products. You can use Gumroad without a monthly fee — in which case you currently pay 8.5% + 30 cents per transaction — or you can pay a $10 monthly fee, which reduces the transaction fee to 3.5% + 30 cents. A service that uses computers called servers to deliver content and other services on the Internet. Web hosting is a common example: when you sign up for a web hosting service, you get access to a web server where you can upload your website and make it publicly viewable. Other common hosting services include email and DNS hosting. A special text file that you can upload to a folder of your website to control how the web server behaves. .htaccess files let you do things like 301 redirects, password-protect folders, and lots more. WordPress uses a .htaccess file to handle permalinks, which translate “friendly” URLs like www.example.com/my-page/ into URLs that WordPress can understand, such as www.example.com/?p=123. Hypertext Transfer Protocol. The language that a web browser uses to communicate with web servers. Whenever you visit a URL in your browser (such as http://www.example.com/mypage.html), the browser uses HTTP to ask the server for the webpage at that URL. The server then sends the data that makes up that page back to the browser — again using HTTP — and the page appears in your browser window. The latest version, HTTP/2, was made a standard in 2015, and is being used in more and more browsers and servers today. It promises much faster browsing than the old version, HTTP 1.1. HTTP Secure. The secure version of HTTP that uses TLS to encrypt all data sent between the browser and the web server. Internet Message Access Protocol. This is the language that your mail app uses to get new mail from your mail server, as well as store mail in folders on your server. It’s usually better to use IMAP instead of POP, because POP doesn’t let you store your mail folders on your server (you have to store them on your computer). With IMAP, you can access your mail folders from any computer or device. IMAP doesn’t handle sending email; that’s the job of SMTP. A number that identifies every computer or router on the Internet. The oldest and most common format is called IPv4 (for example, 93.184.216.34). The newest format is called IPv6 (which looks like this: 2001:0db8:0000:0042:0000:8a2e:0370:7334). IPv6 is (very) slowly replacing IPv4. Internet Service Provider. Usually refers to the company that supplies your connection to the Internet. The world’s second-most popular content management system (after WordPress). You can use Joomla’s web-based admin to create and manage your website or blog. Like WordPress.org, Joomla is open-source and free to use. There are also thousands of Joomla extensions available that let you customise the look and functionality of your website. A bitmap image format created by the Joint Photographic Experts Group (hence the name). Designed for storing photos and other images that have lots of colours and gradual variations between colours. JPEG uses lossy compression, which means that it throws away some data from the image as it compresses it. You can control the amount of compression — and therefore quality — when you create a JPEG image. Higher compression means a lower-quality image, but a smaller file size. Also see GIF and PNG. 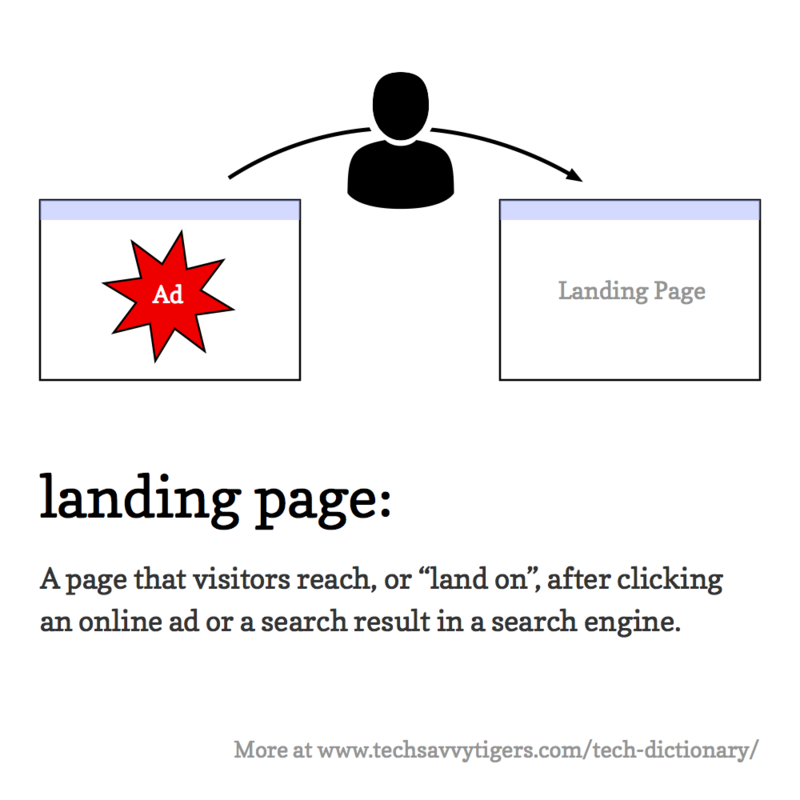 An online marketing term for a page that visitors reach, or “land on”, after clicking an online ad or a search result in a search engine. Typically, a landing page includes sales copy and images/videos; a single call to action (such as clicking a button to make a purchase or sign up for an email list); and no navigation links or menu to take the visitor off the page. A popular online tool for creating landing pages. Leadpages can integrate with many other popular online services to collect email addresses, make online sales, and analyse leads. A popular open-source operating system. An operating system is the software that controls your computer’s basic functions; other examples include Microsoft Windows (for PCs) and macOS (for Macs). Linux is a very popular operating system for public web, mail and DNS servers on the Internet. A popular service for managing and sending emails to mailing lists. Its drag-and-drop template designer makes it easy to design great-looking emails. The free version supports a small list, while the paid versions allow for bigger lists and include autoresponders, A/B testing, and other advanced features. Malicious software. Includes viruses (code that copies itself into other code and performs malicious activities, such as deleting files), backdoors (code that allows hackers to bypass login forms and other security procedures), and adware (code that displays unwanted ads or secretly collects marketing data). When a hacker breaks into a website, they usually install malware on the site. Cleaning up a hacked site involves removing all the malware from the site. Popular open-source software that lets you create and use databases on your web server. MySQL is used by many popular web software packages, including WordPress and Joomla, and usually comes pre-installed with most web hosting plans. It’s also used by Facebook, Twitter, YouTube and many other big-name websites. A computer on the Internet that uses the DNS to turn domain names into IP addresses. A type of software licence that allows anyone to access, change and distribute the code. This allows people all over the world to develop and improve the software. Popular open-source software includes Linux, Apache, MySQL, WordPress and Joomla. The web software that runs Wikipedia is also open-source. A payment processor that allows you to take payments online. Customers can pay you using their PayPal account or a credit card. As well as allowing you to send and receive money manually, PayPal offers lots of ways to integrate with your online store, from simple “Buy Now” buttons and shopping carts through to an API (application programming interface) for more advanced integration. Most e-commerce systems, such as WooCommerce, include PayPal integration. The industry standard image editing software for Mac and PC, made by Adobe. Used by photographers, graphic artists, web designers/developers and many other creative types. Photoshop files have a .psd filename extension. A programming language that usually runs on web servers. It’s used to build some of the most popular web software and sites available today, including WordPress (and its plugins and themes), Facebook, and Wikipedia. 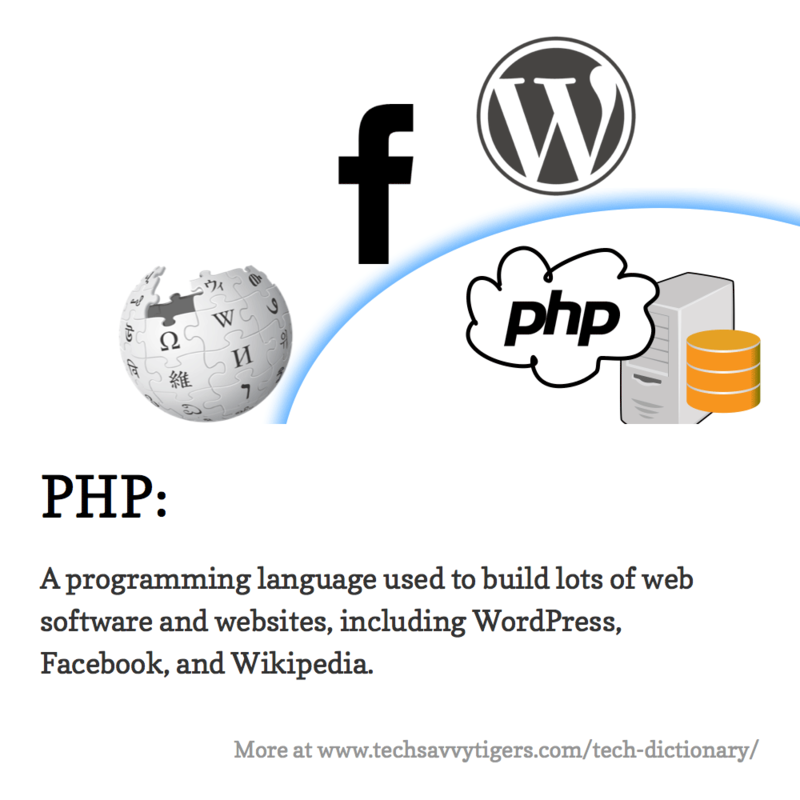 PHP is, rather confusingly, short for PHP: Hypertext Preprocessor. A browser-based tool that lets you manage MySQL databases. It usually comes free with your web hosting account, and you can access it by clicking a link your hosting account’s control panel (such as cPanel or Plesk). phpMyAdmin lets you create, modify and delete databases; upload and download data to/from your database; and edit your database’s data directly via your browser. A web-based photo retouching and graphic design tool. It’s similar to Photoshop in some ways, but with a much smaller feature set. It requires a desktop web browser and the Adobe Flash plug-in to work. The basic version is free, or you can pay a few dollars a month for a “Royale” subscription, which lets you access advanced retouching tools and hide ads. Hosting control panel software that comes installed on many web hosting accounts. Plesk lets you manage your web server in many ways. You can configure your server settings; you can upload and download files and set their permissions; and you can create websites, databases and email addresses. Also see cPanel. Portable Network Graphics. A modern format for compressing and storing bitmap images, designed to replace the older GIF. Available in two main flavours: PNG-8, which only allows for 256 colours (similar to GIF), and PNG-24, which can handle full-colour images such as photos. Unlike the lossy JPEG format, both flavours of PNG are lossless, which means they keep all the image data when compressing the image. PNG is generally preferred to GIF, although GIF has the ability to create animations that can display on any popular browser. Post Office Protocol. Often called “POP3” (short for “POP version 3”). An older method used by mail apps to get mail from a mail server. The main disadvantage of POP is that you can’t store your mail folders on your server, so you can’t access them from anywhere. These days it’s nearly always better to use IMAP instead of POP. Usually refers to a domain registrar. A collection of subscribers to your email list that match certain criteria — for example, subscribers who opened a previous email, or subscribers who purchased a product. Segments are useful for delivering highly-targeted email campaigns to a narrow group of people on your list. Most popular email marketing services such as MailChimp and AWeber support segments. Search engine optimisation. The strategy of improving a website’s ranking in organic (non-paid) search engine results. SEO typically breaks down into two areas: on-page optimisation (tweaking a website’s content and other data to improve the site’s relevance for the desired keywords), and off-page optimisation (building high-quality links to a website in order to improve the site’s status with search engines). An e-commerce service that lets you create your own online store. You don’t need to have a website; Shopify hosts your store on their servers. It supports physical and digital products, as well as variations such as sizes and colours. You pay monthly for the service, and there are various price tiers available; higher tiers offer lower per-transaction fees and more advanced features. Simple Mail Transfer Protocol. The main way that email messages are sent across the Internet. 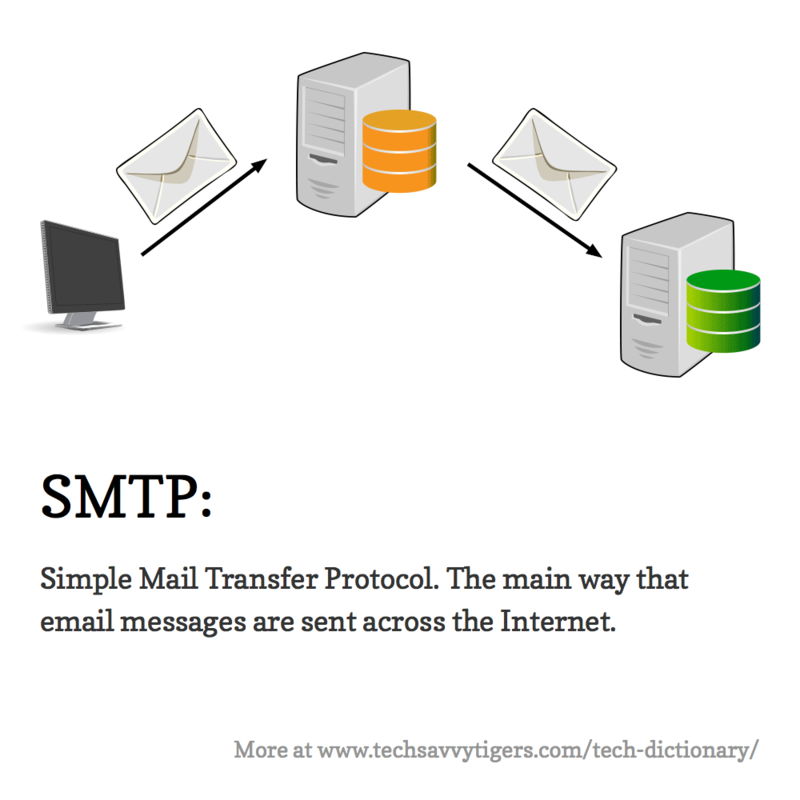 When you hit Send in your mail app, it sends your message to your mail server using SMTP. Your mail server then also uses SMTP to deliver the message to your recipient’s mail server. Your recipient then reads your message using their webmail, or downloads the message to their computer or device using IMAP or POP. A popular online content management service that lets you easily create and update a website or online store, which is then hosted on Squarespace’s servers. You can use your own domain name. It’s an alternative to WordPress.com and other hosted content management systems. A payment processor designed to let internet businesses take payments online via credit card. It’s geared around developers, and provides a fully-featured API (application programming interface) to integrate seamlessly with your online store (such as WooCommerce). It also offers Checkout, a Gumroad-style embedded payment form that’s easy to add to your site. Stripe can also take recurring payments for subscriptions. A domain name that is part of a larger domain. For example, in the domain name store.example.com, “store” is a subdomain. Subdomains can be useful for creating additional websites off your main domain. For example, you might have www.example.com as your main domain, with store.example.com and anothersite.example.com as subdomains. Technically, any domain that comes before a dot in a domain name is a subdomain. So in the domain name www.example.com, “www” is a subdomain of “example“, and “example” is a subdomain of the “com” top-level domain. Usually, though, when talking about web hosting, a subdomain refers to an additional website under your main domain (such as store.example.com). A website security company that can protect your site from hacking and DDoS attacks. They can also clean up your site if you do get hacked. Sucuri also offer a WordPress plugin that can protect your site, in a similar vein to Wordfence. Scalable Vector Graphics. A popular image format for storing and displaying vector images on the web. It’s great for things like icons and diagrams. You can also create a child theme for your site, which uses an existing theme as a parent and tweaks the theme to give it a custom look. The advantage of this approach is that you can update the original parent theme without losing the changes you’ve made to your child theme. Transport Layer Security. A security protocol that web servers use to encrypt and authenticate data sent between the server and the browser. Websites using TLS have URLs that begin with https:// instead of http://. Essential for all sites that accept payment info (such as online stores), but also becoming increasingly common for all types of website. Often known as SSL (which is the old, outdated version of TLS). Often called an SSL certificate (SSL is the old version of TLS). A short block of encrypted text stored on a web server that lets web browsers know that they are visiting a legitimate website. If your website uses TLS (i.e. its URLs start with https://) then it also needs to have a TLS certificate installed, so that visitors can trust that their connection to your site is encrypted and secure. To get a TLS certificate for your site, you first need to purchase one from a certificate authority such as Symantec, then install it on your web server using cPanel or Plesk. If you get stuck, ask your web hosting provider for help! A domain name that sits at the highest level in the DNS. Examples include com, net, org, and info. There are also country-code top-level domains (ccTLDs), such as uk, us and au. A popular WordPress backup plugin. UpdraftPlus regularly and automatically backs up your WordPress site’s files and database to a remote server, such as Dropbox or Google Drive. It can also restore and clone WordPress sites. Regular backups are essential for keeping your WordPress site safe and secure. Uniform Resource Locator. Often called a web address. The text that you type into your web browser to visit a site (such as www.example.com). A web server technique that diverts website visitors from one URL to another. When the user visits a URL in their browser, the server sends back a message telling the browser to visit a different URL instead. The second URL can be on the same domain, or on a different domain. 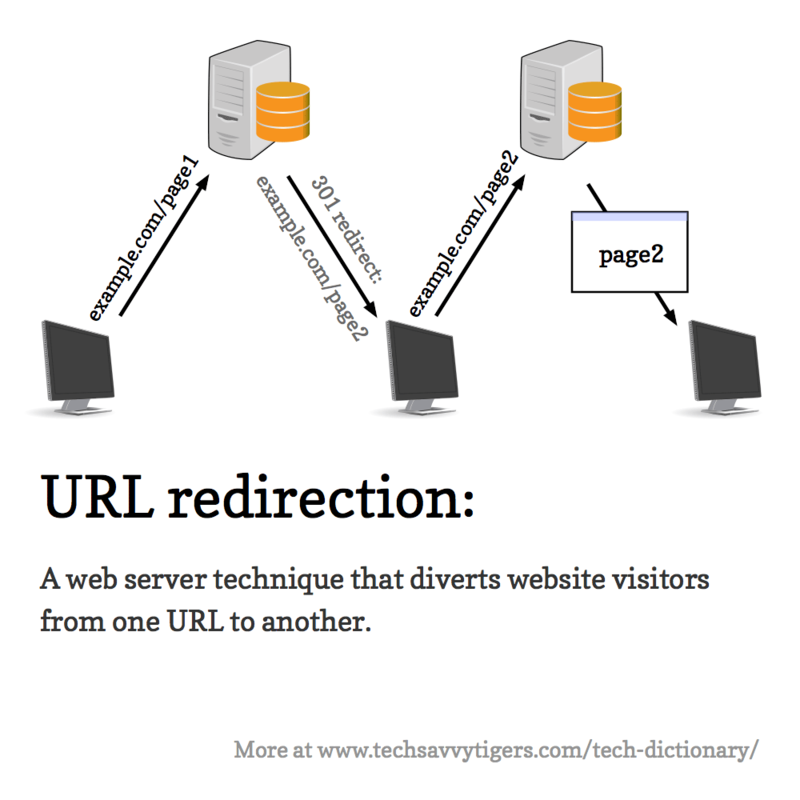 There are two common types of URL redirection. A “301 redirect” tells the browser (and search engines) that the redirect is permanent, and that they should use the newer URL in future. A “302 redirect” means that the redirection is temporary; browsers and search engines should continue to request the original URL. An image made up of mathematically-defined lines and curves. Vector images stay sharp, no matter how much you zoom in. Also see bitmap image. A font format that is designed for using in webpages. Webfonts allow you to choose from a wide variety of fonts for the text in your webpages, rather than being tied to just using the system fonts that come installed on all computers. One of the most popular webfont platforms is Google Fonts. A popular open-source e-commerce plugin for WordPress. WooCommerce lets you create an online store and sell both physical and digital products. It supports PayPal, bank transfer and cash-on-delivery payment methods out of the box, with more payment methods available via WooCommerce extensions (some free, some paid). A popular WordPress plugin that protects your site from hackers and malware. It includes a firewall that blocks hacking attempts before they reach your WordPress code. It can also scan your site for malware that has already been installed and remove it automatically. You can also pay the Wordfence team to clean up your site if it’s been hacked. The world’s most popular content management system. WordPress lets you manage and update your website through its web-based admin area. You can use it to create blogs as well as regular websites. With the huge number of plugins available, you can also use WordPress to create online stores, course platforms, membership sites, directories, and almost every other type of site you can imagine. There are two WordPress “flavours” available: WordPress.com and WordPress.org. The hosted-for-you version of WordPress. You sign up for an account on WordPress.com, and they host your WordPress site for you on their server. This means that, unlike WordPress.org, you don’t have to worry about things like WordPress updates, security and troubleshooting, but it is less flexible and powerful than WordPress.org. There are free and paid versions of WordPress.com. The host-it-yourself version of WordPress. To go this route, you need to get some web hosting, then install the WordPress code on your server (the code is free and open-source). WordPress.org is more complex than WordPress.com and there are a lot more things that can go wrong, from site hacks through to plugin and theme issues. However, WordPress.org is much more flexible and gives you more control over the future direction of your site. The code files that make up the main part of the WordPress content management system. The WordPress core handles things like getting pages and posts from your database and displaying the WordPress admin area. As well as the core, your WordPress site usually includes plugin files, theme files, and your uploaded media files (such as images and videos). A popular WordPress plugin that makes it easier to perform on-page SEO for each page or blog post in your WordPress website. Yoast can check your page content to make sure it includes relevant keywords, as well as flag up and fix other issues which may be harming a page’s ability to rank on search engines. With this dictionary, tech needn’t be tricky! 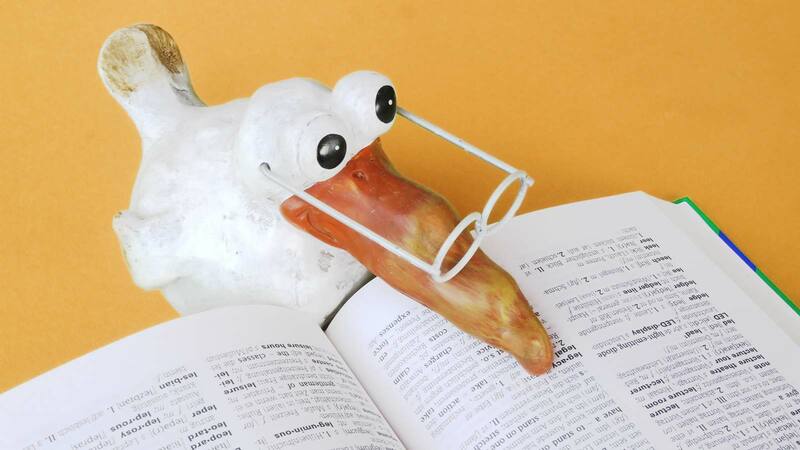 Armed with this dictionary, you can get to grips with those words and phrases that techie types use to talk about your website and online tools. You can talk more easily with your tech people and be confident that you understand what they’re saying!